Acid Rock Drainage (ARD) problems associated with hard rock metal mining are one of the largest environmental challenges for many mining operations. The formation of ARD requires three components: oxygen, water, and reactive rock (commonly found within a mine’s waste rock dumps). Although ARD prevention strategies are numerous, they typically focus on minimizing both water and oxygen flux into and through the reactive waste rock to reduce sulfide oxidation. A common and successful technique is to cover the reactive waste materials with a low permeability cap and vegetative cover, which isolates the reactive rock from oxygen and water. The effectiveness of such caps can be evaluated in situ by monitoring the water movement, oxygen content, and temperatures within the waste rock. Schafer & Associates of Bozeman, Montana, has been monitoring waste rock cap performance and associated ARD development for over ten years. An integral part of these monitoring efforts has included CSI equipment to further characterize water content and temperature changes in the reclaimed materials. Typically, the monitoring sensors are installed along a vertical profile within the cap system and underlying waste rock. Each sensor is wired to a surface-located CSI datalogger for continual data collection. To maximize the usefulness of the data, a surface weather station is normally installed to monitor precipitation events and changes in ambient conditions which can directly impact the cap performance. 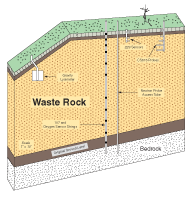 The illustration shows a typical instrumentation monitoring nest for a mine waste rock facility. Subsurface water content and movement can be monitored with a number of techniques and equipment designs, including neutron logging, time domain reflectometry, gravity lysimeters, and heat dissipation units. To enhance water flux interpretations through various capped systems, combinations of the above techniques can be employed. For example, Schafer & Associates is effectively using CSI’s 229-L heat dissipation matrix potential sensor to monitor water changes in a multi-layer cap system consisting of a low permeability barrier layer beneath a vegetation cover. By installing heat dissipation sensors immediately above and below the low permeability layer, the barrier’s effectiveness at limiting infiltration can be evaluated. Also, these sensors demonstrate the wetness of the barrier layer and indicate possible trends which can adversely affect cap performance. Another effective technique for monitoring water content changes in waste rock materials has been the CS615 water content reflectometer probe. Installed horizontally within the upper surface of an undisturbed waste rock pile, the CS615 provides baseline information on water flux into the pile. Following reclamation with a vegetated cap, the CS615 can be used to monitor the net surface water flux into the waste rock while vegetation establishes. The collected data not only allows assessment of the vegetation cap performance, but also enhances input parameters for water balance models. During the formation of ARD, the oxidation of the pyrite in the waste rock materials is an exothermic reaction. As the pyrite oxidizes to ferrous sulfate and acid, 1440 kJ mol-1 of pyrite is generated (Harries and Ritchie 1981). Schafer & Associates is using CSI’s 107 temperature probes to monitor temperature changes across the vertical profile of capped waste rock piles. Using trend analysis techniques along with monitoring data, both ARD development and constructed cap performance can be evaluated. Monitoring reclaimed waste rock piles is an important tool in evaluating the performance of constructed caps. Data generated from continuous monitoring techniques allow improved interpretations of water movement and potential reactions occurring within the cap and waste rock materials. CSI equipment has and will continue to play an integral role in our monitoring and evaluation of engineered controls to limit ARD.